In the three decades since their arrival in the aviation market, Emirates airlines have ascended into nearly every patch of sky around the planet. Along the way, their success inspired the birth of new Persian Gulf air carriers Qatar and Etihad airways. Today, Emirates operate the largest fleet of long haul aircraft in the world, flying to a broader range of global destinations than any other airline. The presence of the “big three” Persian Gulf air carriers has been a disruptive force for the business models of the United States’ legacy carriers, brands such as American Airlines, Delta and United as well as their European counterparts British Airways, Lufthansa and Air France. The Middle Eastern success story has been undeniable and seemingly unstoppable. According to CBS News, the trio combined to order 225 Boeing 777 wide-body jets in 2013, surpassing their 2007 orders worth more than $155 billion. 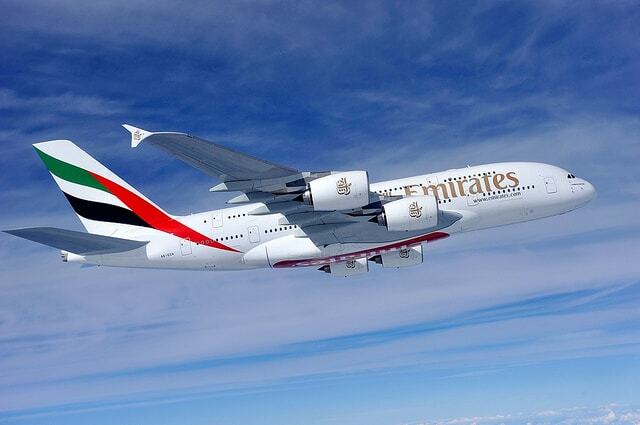 Airbus announced that Emirates alone had also ordered 50 models of its massive A380 aircraft for a price of $23 billion. In 2011, Airbus COO John Leahy told the New York Times that the Gulf trio “should strike fear in the hearts of airlines around the world.” The show of financial muscle two years later was seen as a clear signal of intent from the Gulf carriers that they will continue their push to take on the world’s biggest airline brands. Since then, Dubai’s mega airport known as “World Center” has surpassed London’s Heathrow for international passenger traffic, and the three carriers have found record profit as they open new routes. 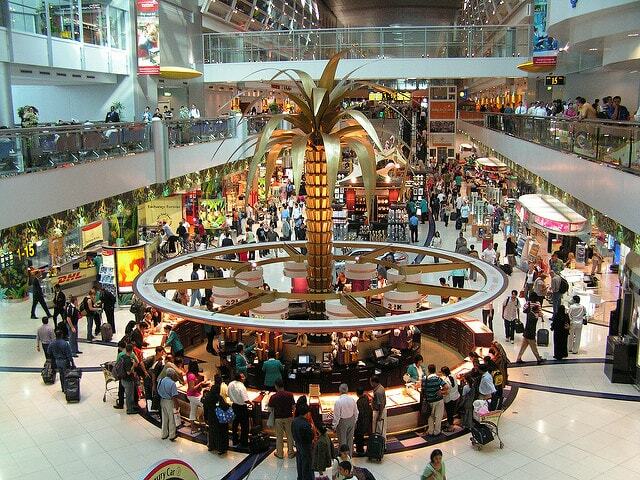 Dubai International Airport. Photo credit: R4vi on Flickr. How these three airlines from two countries with GDPs smaller than many U.S. states came to present a threat to the giants of air travel is a hot topic among aviation experts and industry insiders. There is no shortage of controversy, as Etihad and Qatar are largely considered to be the creation of “aerostates,” air carriers representative of their respective governments. A Qatar airplane at Doha Airport. Photo credit: Martin Alvarez Espinar on Flickr. Much is made of the government subsidies they enjoy and whether or not they are an affront to fair trade and the open skies agreements that have made global air travel as abundant as it is today. The debate surrounding these carriers enters a new day with a new president in the White House. U.S. airlines are hoping for some help in curbing the expansion of Gulf carriers, but in the past, they’ve had more to worry about on their own end than the subsidies of their opponents. U.S. carriers have long been notorious for their lack of customer service. In recent years, this has improved to some extent, but annual reports from the American Customer Satisfaction Index place air carriers narrowly ahead of other agencies known for bad service, including health insurers, the Postal Service, and cable, phone and internet providers. Whether or not that status is justified may be up for debate, but the public perception is not. And it isn’t just the American public. Skytrax World Airlines Awards ranks airlines and airports from around the world and is considered the gold standard for evaluating the quality of an airline product. They routinely place Gulf carriers in their top 10 airlines, while U.S. carriers struggle to break the top 50. This reputation has created an opening for the Persian Gulf carriers. With a staff trained in providing luxury and small adjustments to the long haul flight itinerary, the Gulf carriers have essentially changed the perception of the entire air travel experience, from boarding to baggage claim. While airport kiosks that speed the check-in process are popular, a personal touch is still needed through the rest of the experience. For example, the use of a greeter that talks with passengers as they wait to board, informing them of expected delays or what to expect once on the aircraft. Etihad flight attendants provide a personalized demonstration of how a passenger’s seat features, such as massage, entertainment systems and lighting options, operate. Communication between the crew and passengers is clear and detailed. Wait times and reasons for delays are given without ambiguity, and meal orders are taken with customization and repeated back to the passenger to ensure that they have been properly received. 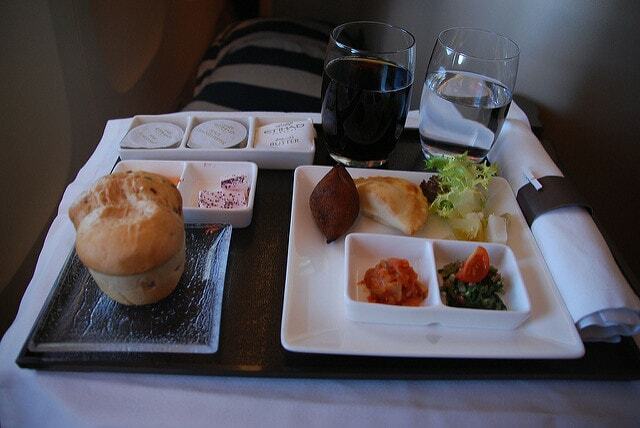 Appetizer food in Etihand plane. Photo credit: Gert Mewes on Flickr. It’s not just in the air or at the gate either that these airlines are surpassing their global competitors. 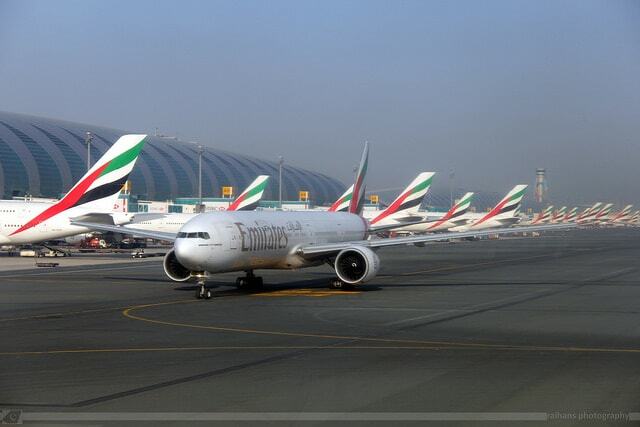 Emirates hub in Dubai now handles more international passenger traffic than any other, yet reviewers of the airport still feel that the connecting experience in Dubai is mostly human. Additionally, the airport houses the world’s largest duty-free area, a hit with passengers to the tune of $1.85 billion in sales for 2016. 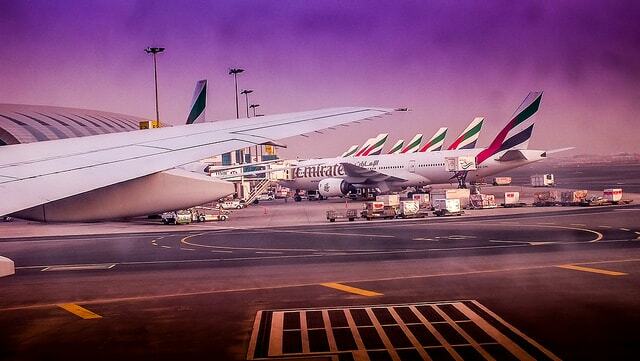 Emirates planes at Dubai International Airport. Photo credit: Riahan S.R. Bakhsh on Flickr. Meanwhile, at the Etihad hub in Abu Dhabi, U.S. bound passengers can go through Customs and Border Patrol Preclearance, meaning when they arrive at their destination, they are treated like domestic travelers and do not have to wait in customs lines. Etihad plane at the Abu Dhabi International Airport. Photo credit: Gert Mewes on Flickr. Qatar’s Doha Hamad International Airport is ranked in the top 10 airports of the world and receives a rare 5-star rating from Skytrax due to its handling of 30 million passengers annually. Its two luxurious and architecturally notable terminals house more than 80 stores and boast concourses lined with art from around the world. A hotel at the airport is available to those with as little as a three-hour layover that houses a spa-inspired pool with runway views and a 1,400 square foot Presidential suite. While U.S. carriers focused on expanding to new places, forging new partnerships with major European airlines and fitting more seats and passengers on flights at the expense of legroom and increased baggage fees, the Gulf trio were focused on technology and comfort. Lie flat seats with adjustable head rests are often standard, not a luxury, on these flights. They also tend to be overshadowed. Emirates offers an in-flight experience for long haul trips that includes an in-flight bar and lounge, showers for first class travelers and a wine list chosen specifically for that flight. In-flight entertainment packages offer a diverse range of options in several languages. A cockpit mounted camera provides a pilot’s view of the voyage. Meals are not taken lightly either. Qatar’s menu includes a cheese plate, options for what type of bread a passenger wants, coffee or tea and a three-course meal. That meal typically includes options well beyond typical airplane food. Regionally-inspired dishes, healthy options, a kids menu and hors d’oeuvres are available to passengers in all classes, with fees varying based on class. 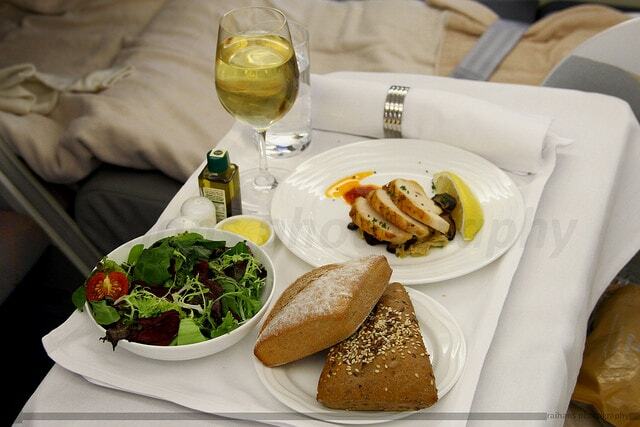 Food on Emirates airplane. Photo credit: Raihan S.R. Bakhsh on Flickr. Lost in all the chatter about the amenities and services is the planes themselves. The Gulf carrier’s newest fleets are a generation apart from the aging planes many U.S. carriers possess. Even when regularly updated, the U.S. carrier’s fleets can’t compete with the newer, more spacious and fuel efficient Airbus 380s or Boeing 777s that make up the bulk of the Gulf carrier’s fleets. A major contributor to the success of Persian Gulf airlines has been the geographic location of their hubs. Providing an ideal layover point for travelers attempting to get from the European Union and United States to destinations in Asia, Africa and the South Pacific, Gulf air carriers are cashing in on a shifting landscape U.S. air carriers are ill-prepared to cope with; the shift in the global economy. 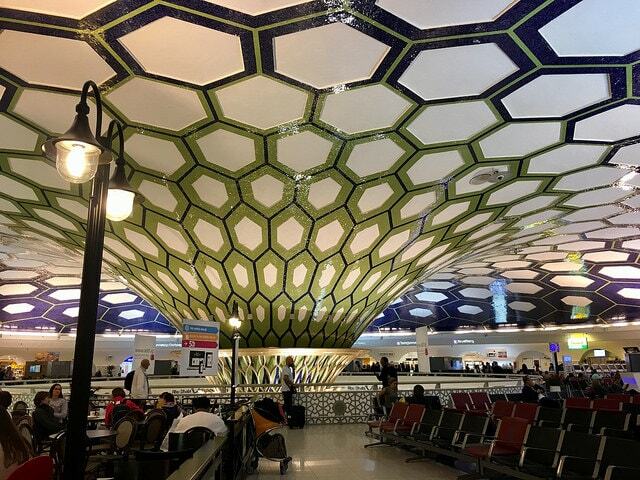 Abu Dhabi International Airport. Photo credit: Thomas Woodtli on Flickr. Dubai’s “World Central” has earned its name for this very reason. 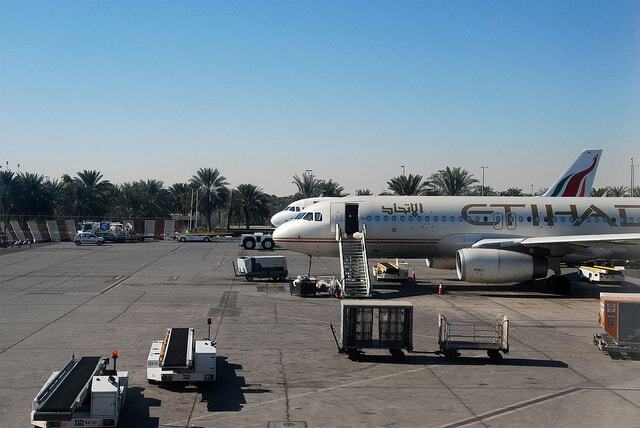 Even if a direct flight is not available, Persian Gulf hubs are an ideal layover destination that make connecting to anywhere in the world, from Singapore to Orlando, feasible and, according to the bulk of airport reviews, enjoyable. Abu Dhabi International Airport, Etihad’s hub, is working toward a 2019 completion date for an expansion project known as the “Midfield Terminal,” which will be able to handle as many 140 planes at a single time and will make the emirate locale one of the busiest airports in the world. If that wasn’t enough, plans are in motion to connect to the current busiest airport in Dubai via Hyperloop, Elon Musk’s proposed supersonic transit system that will conquer the 150-kilometer distance between the two airports in just 12 minutes, making the United Arab Emirates an unparalleled powerhouse in world travel. If a competitive advantage exists for the Gulf carriers, it’s not so much in the subsidies as the way they are treated by their governments. After all, many airlines around the world receive subsidies, from Asia to the Caribbean and even, if you consider government bailout packages, bankruptcy laws and publicly funded airports a subsidy, the U.S. airlines themselves. Instead, the Gulf airlines stand in stark contrast to U.S. carriers in what their government expects from them. U.S. carriers face significant taxes and fees that are unique to them, to the point that as much as 20% of a $300 airfare can go toward taxes. As Forbes notes, that’s a higher tax rate than what consumers pay on alcohol, tobacco and firearms, taxes intended to discourage people from using those things. Meanwhile, Persian Gulf airlines face looser regulations, are not subject to income tax and only recently implemented an airport usage tax on passengers using its hubs to connect, something U.S. carriers have been forced to do for years. Additionally, there are no government-imposed noise curfews for Gulf airports to deal with, but there are government bans on unionization and labor strikes, something that undoubtedly eases operational headaches for these aviation giants. None of this matters to the consumer, however. Competitive advantage or not, the Gulf carriers’ ability to offer superior service at a comparable price point sees them raking in profits and feeding the economies and development of the nations that support them, nations that intend to move their economic positions beyond oil production. In that quest, there is no shortage of funding for these airlines, no dearth of destinations to fly to. The U.S. carriers can attempt to halt any further infiltration into the U.S. market, but it may not matter. Dubai, Doha and Abu Dhabi are too well-positioned financially and geographically to not grow.